If the occasion calls for champagne, then the occasion probably calls for plenty of champagne glasses. 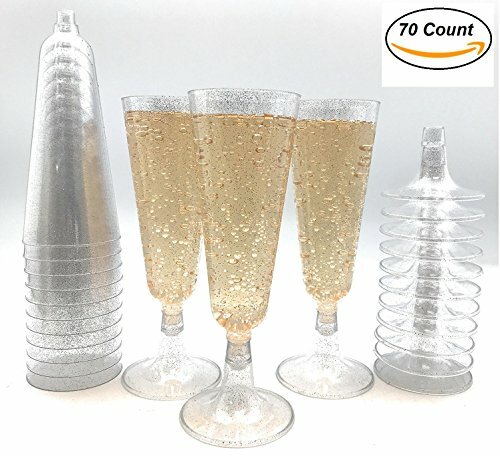 And, because creating a special occasion is really about creating a special mood, We are committed to offering high quality party essentials with an upscale look and feel at an affordable price.These 70 crystal clear 2-piece hard plastic champagne glasses have an elegant, timeless appeal. The glass and base fit together easily and snugly; their graceful shape showcases the delicate effervescence of sparkling champagne. So whether it's a wedding, simple neighborhood get together, holiday soiree or an easy clean-up romantic dinner for two. 2-piece hard plastic 4 ounce flutes have an elegant, timeless appeal. Each package contains 70 easy-to-assemble flutes. The base and glass fit together easily and snugly and the convenient 2-piece construction makes storage a breeze. If you have any questions about this product by Oojami, contact us by completing and submitting the form below. If you are looking for a specif part number, please include it with your message.